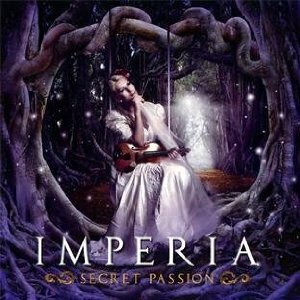 "Secret Passion" is the long awaited new album from Imperia. Its been four years since "Queen of light" so expectations are high. The album opens with "Touch of your hands" - a classic Imperia song with plenty of power and really showcasing Helena's powerful operatic style vocals. Helena Iren Michaelsen has a superbly powerful voice that together with her being Norwegian conjures up visions of a Wagnerian Valkyrie. Tracks such as "Like Rain" give Helena a chance to show that her vocals are not limited to the powerful operatic style, and she sings most of the song in a more normal rock/metal style. "Hold on" is the ballad of the album and again Helena's amazing voice takes on a different style to sing. This album shows just how impressive Helena Iren Michaelsen is as a singer. She is extremely versatile, with plenty of variety between songs, and when she chooses to let rip with her operatic style then the amazing power of her voice really shows. This combination of power and versatility really makes the album - some bands suffer when the singer has a very limited range as the songs can sound too similar to each other, but with "Secret Passion" there s no danger of that. All the songs are clearly Imperia, but they all have their own sound too. "My little angel", is a beautiful song , but rather than having the vocals shared by Helena and Oliver Philipps, I think it would have sounded far better with Helena singing the whole thing as this would have made the song feel so much more personal as its a song about her sleeping daughter. I look forwards to hearing this song live with just Helena singing it. The lyrics for all the songs except "Hold On" are written by Helena Iren Michaelsen, and she also writes the music for four songs, with the rest of the music (except for "Hold on") being written by Imperia's guitaristJan Orkki Yrlund. The bonus track, "Mistress" is a real oddity that just feels totally out of place on the album - it really doesnt feel like an Imperia song at all. This isnt to say that its a bad song at all (its actually very good), but it just isnt anythng like the rest of the songs Imperia have ever done. The first few seconds of the song are enough to flag up that something is very different as the electronic drum beats kick in. Helena's vocals are as good as ever, but the song just isnt right for inclusion in a rock or metal album. I can see this going down very well in dance clubs with its dance-like beat, but its certainly not rock or metal and so would have been better left off the album. Releasing it as a solo single by Helena Iren Michaelsen would have avoided the inevitable criticism from Imperia fans, but would also have given the song more of a chance to be a success as it could have been targeted at the right market.